What we have near our bedside can say a lot about us. There are a few things I find to be absolutely necessary next to a bed, permanent decorative or functional pieces such as eye glasses, cups of water and cell phone charger. What I encourage you to consider is also using this space to create a mood. The first key piece to a bedside is a great lamp, for those who read in bed this is an absolute necessity. This bedroom has a bright lamp that is also attractive. In addition the stepped bedside table has plenty of storage for all of those books. The second thing that I find to be very important near the bed is a clock. I realize that most of us are dependent on our phones as clock, but I believe that having a real clock to glance at is a good thing. Now for some freshness! It is always nice to have some flowers (or a plant) in the bedroom. To make the space more soothing and relaxing it is nice to have a candle as well. Reading is great way to relax before bed, they say it helps to put you to sleep much better than watching TV. We are all guilty of watching TV before bed but having those books in reach can be a helpful distraction! The abstract art is funky twist for the bedside! If books are not your thing, I am sure that magazines are just as relaxing. 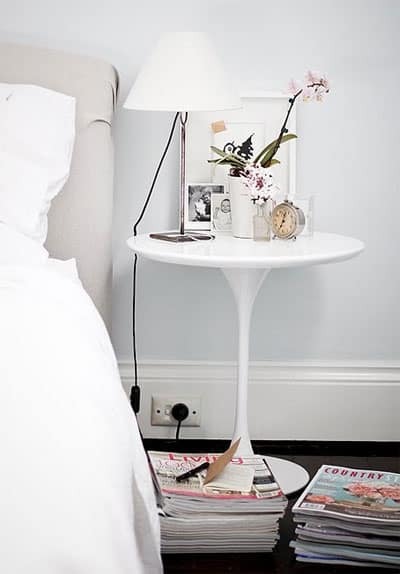 This bedside is so soothing, the white is beautiful and the old photos are a great touch. We do not all have space for all of these pieces but choosing the few that work best for you is important. Make waking up and going to sleep a much more pleasant experience!